Sometimes I crave junky food. Really junky food, like cheese fries or donuts. This week, all I could think about was gyros, overstuffed with meat and oozing with tsatziki. Not wanting to drag my children out to not‐so‐clean‐looking Oakland Gyros down the street and recognizing that my currently dieting husband wouldn’t eat there even if I did, I came up with a lighter version of this late‐night classic. It didn’t totally curb my junk food craving, but it made for an excellent weeknight meal. If you have any leftover corn in your fridge, the accompanying corn salad is a nice way to use it up. I like to cook all my corn on the cob as soon as I buy it to ensure the best flavor. Besides making a salad like the one below, the leftover corn (cut off the cob) also tastes great sauteed with butter, salt and pepper. In a shallow dish, whisk together the olive oil, thyme, oregano, red pepper flakes, and garlic. Place the tenderloins in the dish, covering with as much of the marinade as possible. Cover the dish and marinate in the refrigerator for at least 30 minutes, or up to 12 hours. While the pork marinates, make the cucumber yogurt sauce (below). Preheat the outdoor grill. Remove the pork from the marinade and season liberally with salt and pepper. Cook the pork over a medium flame, turning over after 4 to 5 minutes, until cooked through, about 15 minutes total, depending on the size of your tenderloins. Let rest for 5 to 10 minutes, then slice into thin medallions. While the pork rests, quickly toast the pita on the grill for about 30 seconds on each side. 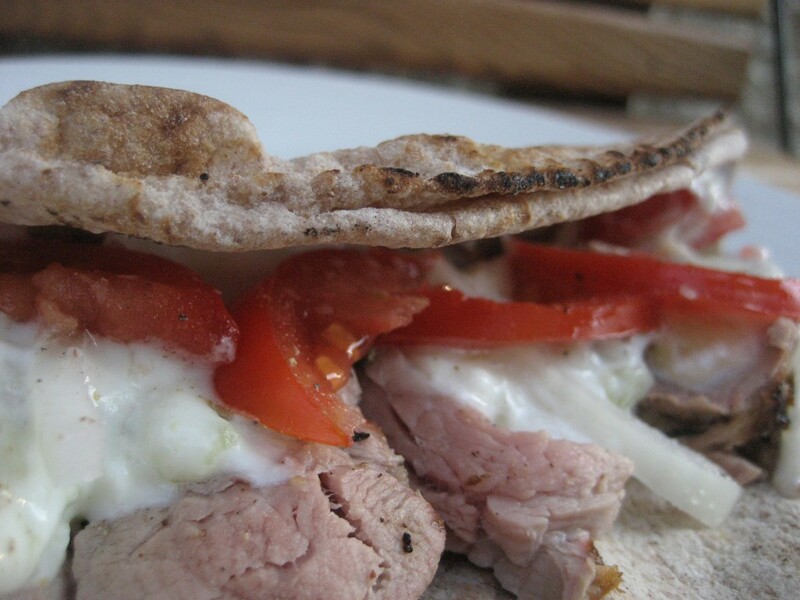 To assemble the sandwiches, place the pork medallions on a pita. Top with tomatoes, onion, and cucumber yogurt sauce. Whisk together all the ingredients in a medium bowl. Chill for at least 15 minutes before serving. In a large pot of boiling salted water, cook the corn until just tender, usually 3 to 5 minutes. Remove the corn, allow to cool and cut the kernels off the cob. In the same pot of boiling water, cook the green beans for 2 to 3 minutes, until crisp tender. Drain the beans and immediately plunge into cold water to stop them cooking. Cool. In a large bowl, whisk together the olive oil, vinegar, and salt. 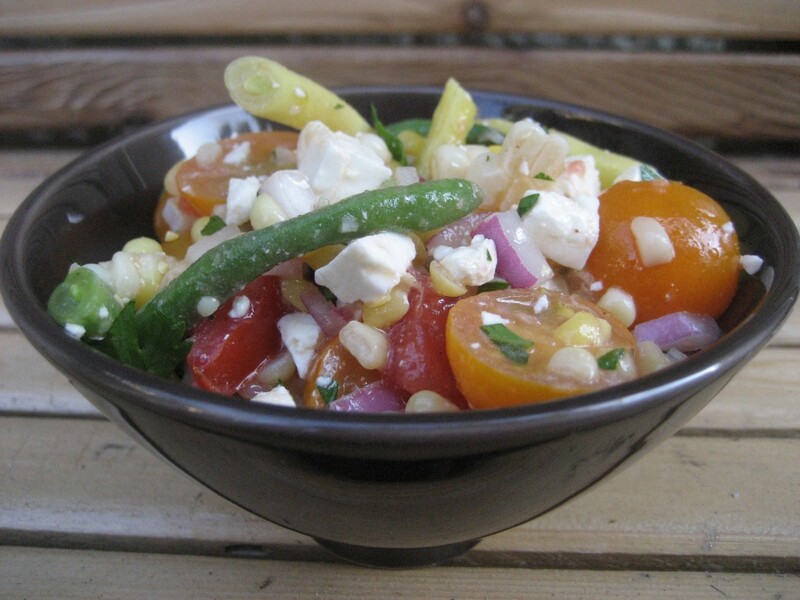 Add the corn, beans, parsley, onion, cherry tomatoes, and feta. Toss gently to coat. This salad can be served at room temperature or chilled. If chilled longer than 8 hours, the salad will become a bit watery (but still very tasty), as the salt and feta draw moisture out of the vegetables .